Note: Some third-party security programs display an alert or warning when installing Creative Suite 5 or CS5.5 products. If you receive an alert, allow the software to install. Before the Adobe Creative Suite 5 installer starts, a bootstrapper application prepares your system for the installation. For assistance with bootstrapper errors, see Troubleshoot error messages | Bootstrapper CS5, CS5.5. When it starts, the installer copies temporary files to your root drive. For assistance with errors that occur during initialization, see the PDApp.log that the installer creates. See Troubleshoot CS5, CS5.5, CS6, and CC installation with install logs. Accept the End-User License Agreement to proceed with the installation. 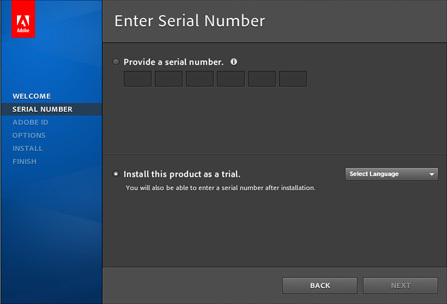 Enter a serial number, or choose to install the product as a trial. Click the Information button for assistance finding retail or volume license serial numbers. If your serial number is not accepted, see Error "The serial number is not valid for this product | Creative Suite". If you install the product as a trial, you don't have to enter a serial number, but you do have to choose a language. Choose the same language you eventually want to use if you serialize the product. 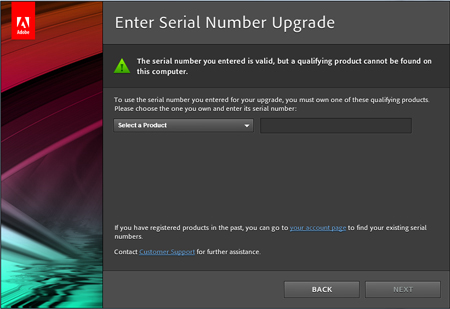 If you entered an upgrade serial number and the installer does not find a qualifying product on your system, it prompts you to enter it. Choose your qualifying product from the Select A Product menu, and then enter that product’s serial number in the text field. To view serial numbers for your registered products, click the Your Account Page link. If you serial number is unavailable or not accepted, see Error "This serial number is not for a qualifying product" | CS6, CS5.5, CS5. Entering your Adobe ID registers your product and starts your complimentary subscription to CS Live. Click Skip This Step to create or enter an Adobe ID at another time. For assistance creating or using Adobe IDs, see Adobe ID, sign-in, and account help. Specify which components to install and where to install them. For information on any warning icons that appear, click More Info. Localized paths sometimes don't display correctly in the Location field, but the product installs to the selected location. A warning icon indicates if there is not enough disk space to complete this installation. If you proceed with the installation without freeing up space, an error message identifying uninstalled components appears at the end of the process. If an alternating installation location is selected, shared components are installed to the system drive. You must have enough free space on both the system drive and the installation location drive to install the product. Adobe After Effects CS5 and CS5.5 and Adobe Premiere Pro CS5 and CS5.5 cannot be selected on a 32-bit Windows machine. For more information, see Install After Effects CS5, Premiere Pro CS5 | Windows Vista, Windows 7 or Install After Effects CS5.5, Premiere Pro CS5.5. Growl is installed and enabled on Mac OS. For assistance with any error messages that occur up to this point, analyze the PDApp.log that the installer creates. See Troubleshoot CS5, CS5.5, and CS6 installation with install logs. After you click Install, a progress bar appears. Installation errors that occur from this point on are recorded in the main CS5 installation log. See Troubleshoot CS5, CS5.5, and CS6 installation with install logs. Select a conflicting process from the list and click End Process. Repeat step 3 for any additional conflicting processes. In the Finder, choose Go > Utilities. Double-click the Activity Monitor application. From the pop-up processes filter menu in the upper-right corner of the window, choose All Processes. Select a conflicting process from the list and click Quit Process. Then, click Force Quit. Repeat step 4 for any additional conflicting processes. If the installation completes successfully, the Finish panel displays a thank you message. Click Done to start using your product. This error means that none of the product components was able to install. This means that only some of the product components were able to install. Click Troubleshooting to display the error message messages or codes and some troubleshooting tips. To troubleshoot installation failures, try the following, in order. If you haven't already done so, search the knowledgebase for errors. Use any additional information that appears below the error message to search for a solution in the Adobe Knowledgebase. Select the error information and press Ctrl + C (Windows) or Command +C (Mac OS) to copy it. Visit the Adobe Support website and choose your product from the Select Product Support Center menu. Paste the error text into the Search The Knowledgebase field and click Search. Note: Omit file paths and registry keys from the search string. Use the Adobe Support Advisor. The Adobe Support Advisor is an AIR app that helps identify and resolve installation issues. Click the Customer Support link in the Installation Status window, or review the installation log files manually. Identify errors in the installation logs. 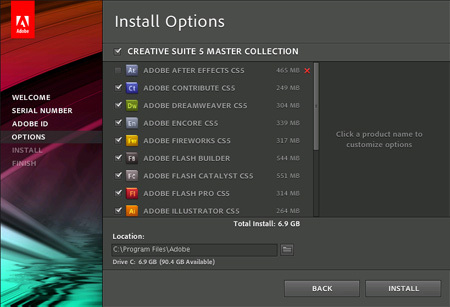 The Adobe Creative Suite 5 installer records all errors and actions in two log files. You can use the logs to search for solutions in the Adobe Knowledgebase. See Troubleshoot CS5, CS5.5, and CS6 installation with install logs. Follow the steps in General installation troubleshooting | Adobe CS5 and CS5.5 products. If you still cannot install your Adobe Creative Suite 5 product, contact Adobe Support. If you ran the Adobe Support Advisor and uploaded your Support Package, Adobe can use the ASA token number to access your error information.